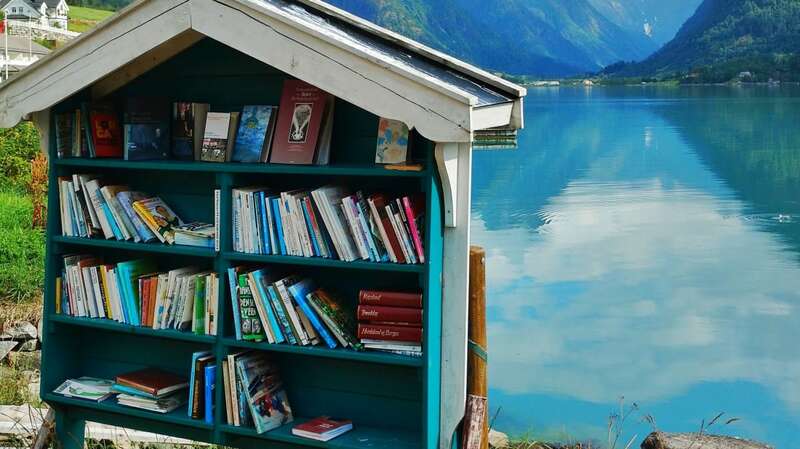 Mundal, Norway, isn't the busiest town in Norway, but as long you're an avid reader, you'll never get bored there. According to Travel + Leisure, Mundal is home to more books than people, a distinction earning it the nickname "The Norwegian Book Town." Mundal is small, with only 280 residents, but it boasts an impressive second-hand books scene, with roughly 150,000 books scattered throughout the town. And the reading materials aren't limited to its many secondhand book shops: They can be found in abandoned sheds, a grocery store, a post office, and even an old ferry waiting area. If all the bookshelves in the town were lined up end-to-end, they would cover more than 2.5 miles. Only accessible by boat until the mid-1990s, Mundal is one of the most isolated book towns on Earth. Picking up a literary souvenir from the town isn't easy, as it's only open to visitors during the warmer months from May though September. To get your hands on a book from Mundal without booking a trip to Norway, you can purchase one online.